Friday (Aug 26), President Obama expanded the Papahānaumokuākea Marine National Monument off the coast of Hawaii to encompass more than half a million square miles — making it the world’s largest marine protected area. Home to more than 7,000 marine mammals, some of them critically endangered, the monument will also permanently protect pristine coral reefs, deep sea marine habitats, and important ecological resources. The monument was originally created in 2006 by President George W. Bush and designated as a UNESCO World Heritage Site in 2010. Since that time, new scientific exploration and research has revealed new species and deep sea habitats as well as important ecological connections between the existing monument and the adjacent waters. This designation will expand the existing Marine National Monument by 442,781 square miles, bringing the total protected area of the expanded monument to 582,578 square miles. It was made in response to a proposal put forward by Hawaii Senator Schatz and prominent Native Hawaiian leaders, in addition to significant input and local support from Hawaii elected officials, cultural groups, conservation organizations, scientists and fishermen. This step also builds on a rich tradition of marine protection in Hawaiian waters and world-class, well managed fisheries, including a longline fishing fleet that is a global leader in sustainable practices. The President will travel to Hawaii next week. On Wednesday evening (Aug 31), he will address leaders from the Pacific Island Conference of Leaders and the IUCN World Conservation Congress, which is being hosted in the United States for the first time. On Thursday, he will travel to Midway Atoll, located within the Papahānaumokuākea Marine National Monument, to mark the significance of this monument designation and highlight first-hand how the threat of climate change makes protecting our public lands and waters more important than ever. Through Proclamation 8031 of June 15, 2006, as amended by Proclamation 8112 of February 28, 2007, the President established the Papahānaumokuākea Marine National Monument (Monument), to protect and preserve the marine area of the Northwestern Hawaiian Islands and the historic and scientific objects therein. As stated in Proclamation 8031, the area, including the Northwestern Hawaiian Islands Coral Reef Ecosystem Reserve, the Midway Atoll National Wildlife Refuge, the Battle of Midway National Memorial, and the Hawaiian Islands National Wildlife Refuge, supports a dynamic reef ecosystem with more than 7,000 marine species, of which approximately one quarter are unique to the Hawaiian Islands. This diverse ecosystem is home to many species of coral, fish, birds, marine mammals, and other flora and fauna, including the endangered Hawaiian monk seal, the threatened green sea turtle, and the endangered leatherback and hawksbill sea turtles. In addition, this area has great cultural significance to the Native Hawaiian community and a connection to early Polynesian culture worthy of protection and understanding. An area adjacent to the Monument, and that will constitute the Monument Expansion as set forth in this proclamation, includes the waters and submerged lands to the extent of the seaward limit of the United States Exclusive Economic Zone (U.S. EEZ) west of 163° West Longitude, and extending from the boundaries depicted on the map accompanying Proclamation 8031 as amended by Proclamation 8112 (adjacent area). As required by the Antiquities Act, the adjacent area contains objects of historic and scientific interest that are situated upon lands owned or controlled by the Federal Government; they are geological and biological resources that are part of a highly pristine deep sea and open ocean ecosystem with unique biodiversity and that constitute a sacred cultural, physical, and spiritual place for the Native Hawaiian community. This unique ecosystem has many significant features. 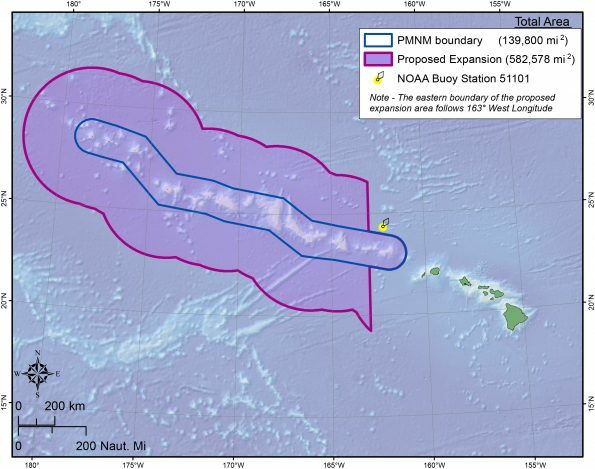 Important geological features of the adjacent area include more than 75 seamounts, as well as a non-volcanic ridge that extends southwest towards the Johnston Atoll. Together, these features form biodiverse hotspots in the open ocean that provide habitat for deep-sea species, including sponges, other invertebrates, fish, and colonies of corals many thousands of years old. Recent science demonstrates that seamounts harbor a multitude of species with unique ecological traits, some newly discovered. Seamounts, ridges, and other undersea topographic features are important stepping stones that enable marine organisms to spread throughout the Hawaiian Archipelago, and between Hawaii and other archipelagoes. Undisturbed seamount communities in the adjacent area are of significant scientific interest because they provide opportunities to examine the impacts of physical, biological, and geological processes on ecosystem diversity, including understanding the impacts of climate change on these deep-sea communities. These seamounts and ridges also provide the opportunity for identification and discovery of many species not yet known to humans, with possible implications for research, medicine, and other important uses. Recent scientific research, utilizing new technology, has shown that many species identified as objects in Proclamation 8031 inhabit previously unknown geographical ranges that span beyond the existing Monument, and in some cases the adjacent area also provides important foraging habitat for these species. For example, the endangered Hawaiian monk seal forages well beyond the existing Monument. Scientific research on Hawaiian monk seal foraging behavior has shown that monk seals may travel 80 miles and dive to depths of almost 2,000 feet while feeding. Important bird species abound in the Monument and the adjacent area. Birds from the world’s largest colonies of Laysan albatross, Black-footed albatross, and Bonin petrels, as well as significant populations of shearwaters, petrels, tropicbirds, the endangered Short-tailed albatross, and other seabird species forage in the adjacent area. We now know that albatrosses and Great Frigatebirds rely on the adjacent area during chick-brooding periods, when their foraging is focused within 200 miles of the nesting colonies on the Monument’s islands and atolls. At other times, these wide-ranging species use a much broader range (over 1,600 miles) for foraging. The adjacent area is a foraging and migration path for five species of protected sea turtles. While green and hawksbill turtles use the near-shore waters of the Monument for nesting, these species — along with the endangered leatherback turtle and threatened loggerhead and olive ridley turtles — migrate through the adjacent area to reach high-productivity foraging areas. Twenty-four species of whales and dolphins have been sighted in the adjacent area. Three of these species are listed under the Endangered Species Act as threatened or endangered: sperm whales, fin whales, and sei whales. Cetacean use of the Monument Expansion varies; resident species such as spinner dolphins, false killer whales, and rough-toothed dolphins utilize the area year-round, whereas other species, such as humpback whales, use it as a wintering area. A wide variety of tropical and temperate water dolphin species inhabit the Monument Expansion, including pantropical spotted dolphins, spinner dolphins, striped dolphins, rough-toothed dolphins, and bottlenose dolphins. Several rarely sighted species of dolphin inhabit the area, including Risso’s and Fraser’s dolphins. Both of these species are primarily oceanic and found in waters deeper than 1,000 meters. Acoustic evidence also shows that endangered blue whales — the largest animals on Earth — visit the area and may migrate past the Hawaiian Islands twice a year. Sharks, including tiger sharks and Galapagos sharks, are key species in the ecosystems of the Monument and adjacent area. These large and highly mobile predators have expansive home ranges and regularly move across the boundaries of the current Monument into the adjacent waters. Additionally, blue sharks, three species of thresher sharks, and two species of mako sharks inhabit the open ocean environment of the adjacent area. The Monument and adjacent area are part of the most remote island archipelago on Earth. This biological and geographic isolation, coupled with unique oceanographic and geological conditions, has resulted in an ecosystem critical for new species formation and endemism. These forces result in some of the most unique and diverse ecological communities on the planet. The ocean will always be seen as an integral part of cultural identity for the Native Hawaiian community. The deep sea, the ocean surface, the sky, and all the living things in the area adjacent to the Monument are important to this culture and are deeply rooted in creation and settlement stories. Native Hawaiian culture considers the Monument and the adjacent area a sacred place. This place contains the boundary between Ao, the world of light and the living, and Pō, the world of the gods and spirits from which all life is born and to which ancestors return after death. Long-distance voyaging and wayfinding is one of the most unique and valuable traditional practices that the Native Hawaiian community has developed and continues to advance. Once on the verge of cultural extinction, new double-hulled sailing canoes, beginning with the Hōkūle’a in the 1970s, are bringing voyaging and wayfinding to new generations. This traditional practice relies on celestial, biological, and natural signs, such as winds, waves, currents and the presence of birds and marine life. The open ocean ecosystem and its natural resources in the adjacent area play an important role within the cultural voyaging seascape within the Hawaiian Archipelago. World War II shipwrecks and aircraft in the adjacent area, though not identified as objects under the Antiquities Act in this proclamation, are of great historic interest. The naval portion of the Battle of Midway, one of the most important naval battles of World War II, occurred approximately 200 miles to the northeast of Midway Atoll, in the adjacent area. Deep-sea technologies have enabled the USS Yorktown, an aircraft carrier torpedoed during the battle, to be found at more than 16,000 feet below the ocean’s surface. Eyewitness accounts and historical records tell the stories of the destroyer USS Hammann, five Japanese vessels (the four aircraft carriers Hiryu, Soryu, Kaga, and Akagi, and the cruiser Mikuma), and several hundred aircraft that were also lost during the battle in this area. The locations of these vessels have yet to be identified. All told, the adjacent area serves as a final resting place for the more than 3,000 people lost during the battle. NOW, THEREFORE, I, BARACK OBAMA, President of the United States of America, by the authority vested in me by section 320301 of title 54, United States Code, hereby proclaim the objects identified above that are situated upon lands and interests in lands owned or controlled by the Federal Government to be part of the Papahānaumokuākea Marine National Monument Expansion (Monument Expansion) and, for the purpose of protecting those objects, reserve as a part thereof all lands and interests in lands owned or controlled by the Federal Government within the boundaries described on the accompanying map entitled “Papahānaumokuākea Marine National Monument Expansion” attached hereto, which forms a part of this proclamation. The Monument Expansion comprises the waters and submerged lands in the U.S. EEZ west of 163° West Longitude adjacent to the Monument. The Federal lands and interests in lands reserved consist of approximately 442,781 square miles, which is the smallest area compatible with the proper care and management of the objects to be protected. All Federal lands and interests in lands within the boundaries of the Monument Expansion are hereby appropriated and withdrawn from all forms of entry, location, selection, sale, leasing, or other disposition under the public land laws to the extent that those laws apply, including but not limited to, withdrawal from location, entry, and patent under mining laws, and from disposition under all laws relating to development of oil and gas, minerals, geothermal, or renewable energy. Lands and interest in lands within the Monument Expansion not owned or controlled by the United States shall be reserved as part of the Monument Expansion upon acquisition of title or control by the United States. Nothing in this proclamation shall change the management of the Papahānaumokuākea Marine National Monument or any of the provisions specified in Proclamations 8031 and 8112. Terms used in this proclamation shall have the same meaning as those defined in Proclamation 8031. The Secretaries of Commerce and the Interior (Secretaries) shall share management responsibility for the Monument Expansion. The Secretary of Commerce, through the National Oceanic and Atmospheric Administration (NOAA), and in consultation with the Secretary of the Interior, shall have responsibility for management of activities and species within the Monument Expansion under the Magnuson-Stevens Fishery Conservation and Management Act, the Endangered Species Act (for species regulated by NOAA), the Marine Mammal Protection Act, and any other applicable Department of Commerce legal authorities. The Secretary of the Interior, through the United States Fish and Wildlife Service (FWS), and in consultation with the Secretary of Commerce, shall have responsibility for management of activities and species within the Monument Expansion under its applicable legal authorities, including the National Wildlife Refuge System Administration Act, the Refuge Recreation Act, and the Endangered Species Act (for species regulated by FWS), and Public Law 98-532 and Executive Order 6166 of June 10, 1933. Additionally, the Secretary of Commerce should consider initiating the process under the National Marine Sanctuaries Act (16 U.S.C. 1431 et seq.) to designate the Monument Expansion area and the Monument seaward of the Hawaiian Islands National Wildlife Refuge and Midway Atoll National Wildlife Refuge and Battle of Midway National Memorial as a National Marine Sanctuary to supplement and complement existing authorities. The Secretaries shall prepare a joint management plan, within their respective authorities and after consultation with the State of Hawaii, for the Monument Expansion within 3 years of the date of this proclamation, and shall promulgate as appropriate implementing regulations, within their respective authorities, that address any further specific actions necessary for the proper care and management of the objects and areas identified in this proclamation. The Secretaries shall revise and update the management plan as necessary. In developing and implementing any management plans and any management rules and regulations, the Secretaries shall consult, designate, and involve as cooperating agencies the agencies with jurisdiction or special expertise, including the Department of Defense and Department of State, in accordance with the National Environmental Policy Act (42 U.S.C. 4321 et seq. ), and its implementing regulations. If the Secretaries deem it beneficial, they may prepare a joint management plan for the entire Monument and Monument Expansion area, consistent with the provisions of the respective proclamations. The Secretaries shall coordinate and work cooperatively with the Department of Defense, through the United States Navy, to protect, under the Sunken Military Craft Act, Public Law 108-375, 118 Stat. 1811, and any other applicable legal authorities, United States sunken military vessels and aircraft that are found within the geographic boundaries of the Monument Expansion. Any sunken craft of a foreign state found within the geographic boundaries of the Monument Expansion may be protected to the extent authorized under U.S. law, consistent with the President’s Statement on United States Policy for the Protection of Sunken Warships (January 19, 2001). This proclamation shall be applied in accordance with international law. The management plans and their implementing regulations shall impose no unlawful restrictions on innocent passage or otherwise unlawfully restrict navigation and overflight and other internationally recognized lawful uses of the sea in the Monument and Monument Expansion and shall incorporate the provisions of this proclamation regarding U.S. Armed Forces actions and compliance with international law. No restrictions shall apply to or be enforced against a person who is not a citizen, national, or resident alien of the United States (including foreign flag vessels) unless in accordance with international law. Also, in accordance with international law, no restrictions shall apply to foreign warships, naval auxiliaries, and other vessels owned or operated by a state and used, for the time being, only on Government non-commercial service, in order to fully respect the sovereign immunity of such vessels under international law. The Secretary of State, in consultation with the Secretaries of Commerce and the Interior, shall take steps to protect the Monument Expansion as it does with respect to the Monument as specified in Proclamation 8031. 8. Commercial fishing and possessing commercial fishing gear except when stowed and not available for immediate use during passage without interruption through the Monument Expansion. 6. Non-commercial fishing, provided that the fish harvested, either in whole or in part, cannot enter commerce through sale, barter, or trade, and that the resource is managed sustainably. The prohibitions required by this proclamation shall not restrict scientific exploration or research activities by or for the Secretaries, and nothing in this proclamation shall be construed to require a permit or other authorization from the other Secretary for their respective scientific activities. The prohibitions required by this proclamation shall not apply to activities necessary to respond to emergencies threatening life, property, or the environment, or to activities necessary for law enforcement purposes. 1. The prohibitions required by this proclamation shall not apply to activities and exercises of the U.S. Armed Forces, including those carried out by the United States Coast Guard. 2. The U.S. Armed Forces shall ensure, by the adoption of appropriate measures not impairing operations or operation capabilities, that its vessels and aircraft act in a manner consistent, so far as is practicable, with this proclamation. 3. In the event of threatened or actual destruction of, loss of, or injury to a Monument Expansion resource or quality resulting from an incident, including but not limited to spills and groundings, caused by a component of the Department of Defense or the United States Coast Guard, the cognizant component shall promptly coordinate with the Secretaries for the purpose of taking appropriate action to respond to and mitigate any harm and, if possible, restore or replace the Monument resource or quality. 4. Nothing in this proclamation or any regulation implementing it shall limit or otherwise affect the U.S. Armed Forces discretion to use, maintain, improve, manage, or control any property under the administrative control of a Military Department or otherwise limit the availability of such property for military mission purposes, including, but not limited to, defensive areas and airspace reservations. Nothing in this proclamation shall be deemed to diminish or enlarge the jurisdiction of the State of Hawaii. The Monument Expansion shall be the dominant reservation. Nothing in this proclamation shall be deemed to revoke any existing withdrawal, reservation, or appropriation. Warning is hereby given to all unauthorized persons not to appropriate, excavate, injure, destroy, or remove any feature of this Monument Expansion and not to locate or settle upon any lands thereof. This proclamation is not intended to, and does not, create any right or benefit, substantive or procedural, enforceable at law or in equity by any party against the United States, its departments, agencies, or entities, its officers, employees, or agents, or any other person. IN WITNESS WHEREOF, I have hereunto set my hand this twenty-sixth day of August, in the year of our Lord two thousand sixteen, and of the Independence of the United States of America the two hundred and forty-first.